Oklahoma Teachers Set For Statewide Walkout Amid Continued Pay Dispute : The Two-Way Teachers have rejected a pay raise passed by the state legislature last week, saying it doesn't go far enough in addressing deep cuts in education in recent years. In this Tuesday, March 27, 2018, photo, teacher Adrien Gates pickets with other educators on a street corner in Norman, Okla.
An estimated 30,000 are expected at a demonstration in the capital, Oklahoma City, on Monday. 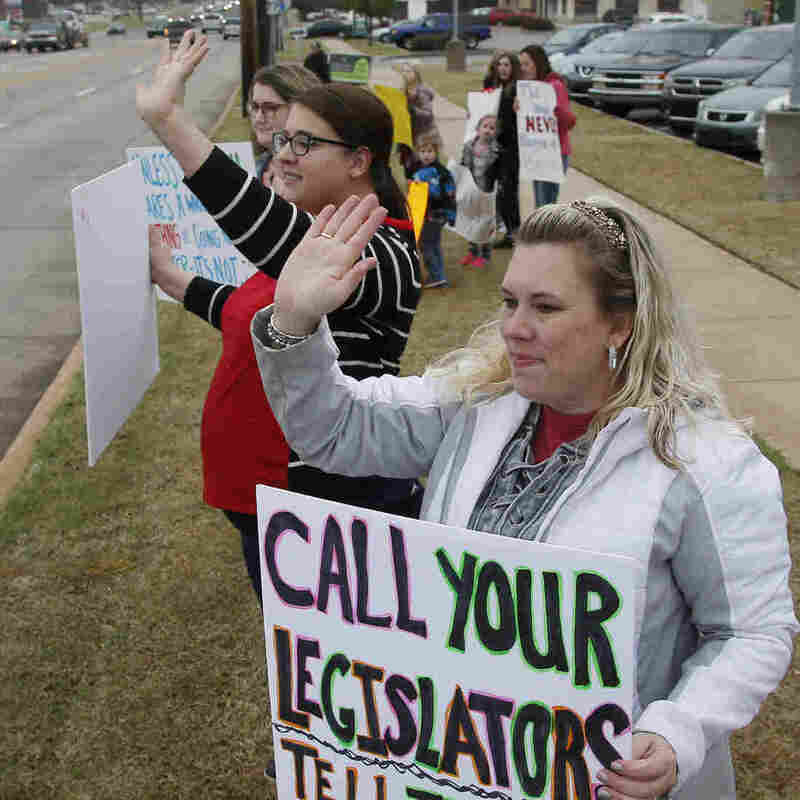 "It's day-by-day, depending upon the Legislature fulfilling their promise," Alicia Priest, president of the Oklahoma Education Association teachers' union, said according to The Associated Press. "We're going to say that our Legislature started the process and they have a moral obligation to invest in our children and our children's future. That obligation has not been met yet. Funding for our students is an issue in every schoolhouse in the state of Oklahoma." "We need more money for support staff, we need more money for the state education budget, we need more money for the cost of living adjustment for retired teachers," Greg Oppel, a social studies teacher at Edmond Memorial High School was quoted by NewsOK as saying. "For years teachers and educators have been asking the Legislature to reverse a decade of school funding cuts and to increase teacher pay, which had ranked as one of the worst in the nation. Since 2008, state funding for public schools has decreased by nearly 9 percent, while student enrollment has increased by over 8 percent. Adjusted for inflation, the state's general funding of schools is down 28 percent per student since 2008." Three of the state's largest districts – Oklahoma City, Tulsa and Edmond – plan to close on Monday to honor the walkout. According to the AP, "Some schools are offering free meals to students aged 18 or younger while various churches, faith organizations and charitable agencies are providing free day-care services." It's unclear how long the walkout will continue or whether the legislature might take another look at its funding measure. Oklahoma State Sen. Joseph Silk told NPR's All Things Considered on Sunday: "[From] my perspective, we just passed a $447 million tax increase, so that's a substantial amount of revenue for one year. So, I don't see the lawmakers doing anything else this year regarding education funding."